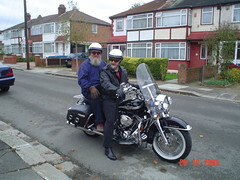 When we visited California I decided I would love a ride on a Harley Davidson. Now I have found an American friend over here who has kindly given me a ride. It is an experience like no other, the sound and feel of real power. Steam engines and Harleys are transports that delight the senses.